There are two types of powderpost beetles. 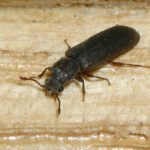 The Lyctid powderpost beetle only attacks hardwoods and can be found in hardwood floors, kitchen cabinets, baseboard trim, antiques and other objects made of hardwood materials. Anobiid powderpost beetles will infest both hardwoods and softwoods, and it is the larval stage that does the damage as they feed and develop in the infested wood. They prefer seasoned, older wood located in cooler areas of the home including floor joists in crawl spaces of houses, attic joists and wall studs. They can cause structural damage. Most powder post beetles are introduced into homes in lumber or finished wood products including flooring, furniture, paneling, etc. Lumber which has been improperly stored or dried should not be used in the home and inspect the wood for the presence of beetle holes. Typically, serious infestations of powder post beetles result from people using old lumber from a barn or woodpile behind their house to panel a room or build an addition.